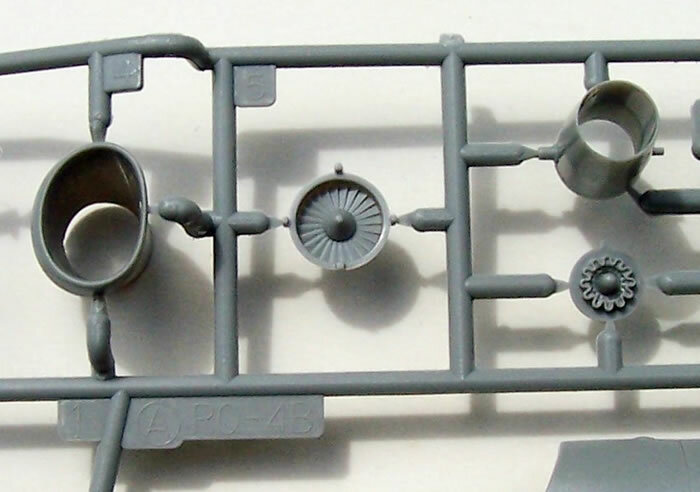 31 grey styrene airframe parts, 1 metal screw, and a decal sheet for 5 “What If” colour schemes. 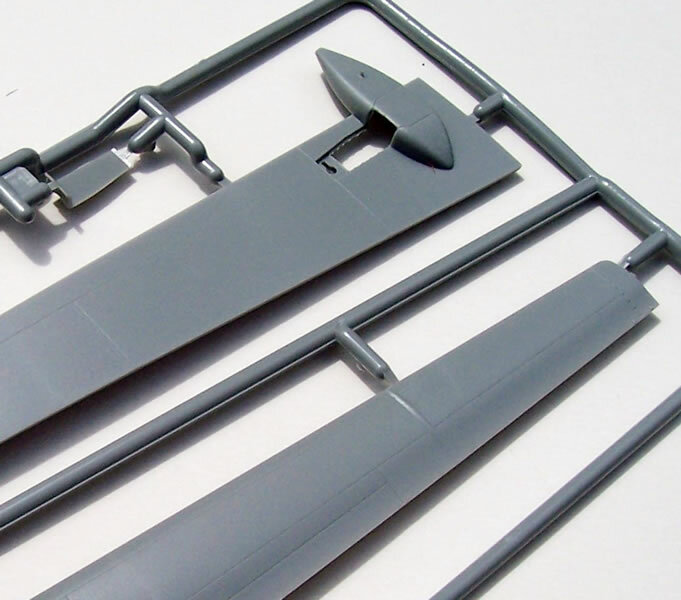 Good quality, nice mouldings with refined detail, one-piece engine air-intake ducting a plus, simple kit and good quality decals. This release is possibly premature as the RQ-4N (renamed MQ-4C since 2010) is not yet in production or service. Consequently all kit markings are for “What If” schemes. There is no advice on the box-art or instructions that the markings are imaginary, which I regard as misleading. A nice kit that builds to an impressive size, and is an interesting subject. No authentic markings for the trial RQ-4N’s is a pity. The “What If” markings would be ok if the box top advised of them, but it doesn’t. I feel this is a misleading practice that kit manufacturers should be discouraged from. 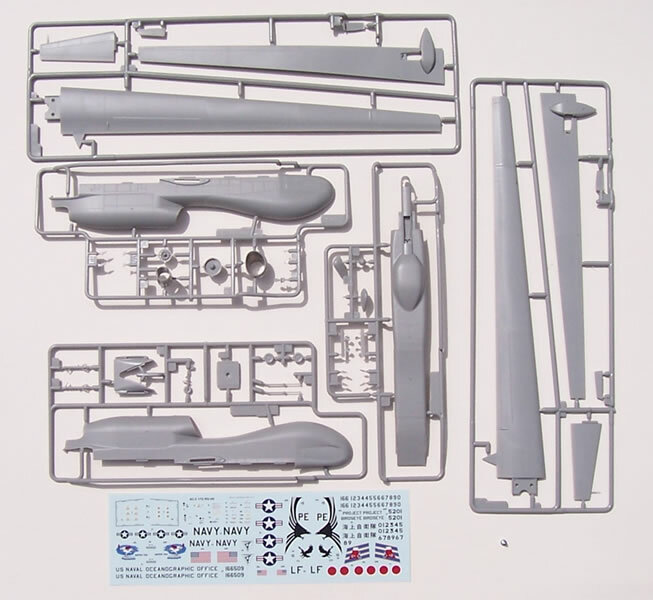 I recommend holding off buying this RQ-4N kit until the MQ-4C is in production and Platz issue a kit with in-service markings. Meanwhile I recommend buying the Platz RQ-4B with authentic markings if you want a Global Hawk model. The RQ-4N is a marinised variant of the RQ-4B employed by the USAF. The USN intends to use an Unmanned Aircraft System (UAS) as the platform for the BAMS suite of maritime surveillance sensors and communications systems. (BAMS stands for Broad Area Maritime Surveillance). Two RQ-4B’s were used for trials by the USN, and I believe one was modified to RQ-4N standards. There are some differences in the bulges on the fuselage underside due to the RQ-4N’s different sensor fit compared to the RQ-4B. The RQ-4N was renamed MQ-4C in 2010. The first MQ-4C is expected to rollout in spring 2012, and be operational by 2015. 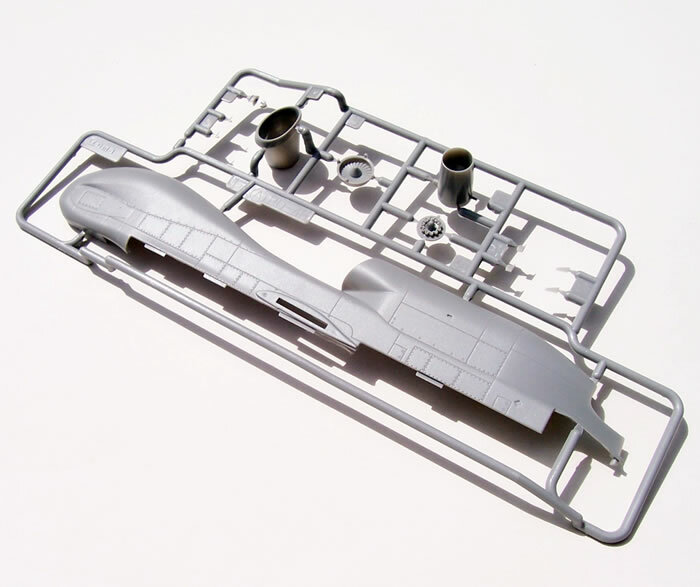 The Platz RQ-4B kit received a first look & full construction review by Brett Green, and can be viewed by clicking here. The Two kits are essentially the same, differing only in the fuselage underside and a radome or two. For this reason I shall keep this review shorter than usual and address only the RQ-4B aspects. 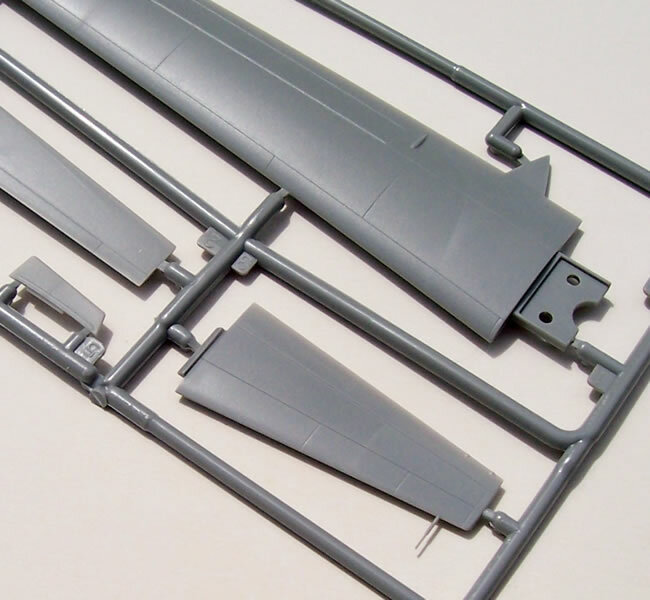 Markings aside, the only difference between the kits is the sprue with the fuselage underside for the RQ-4N. When first examining this kit I was pleased that it offered some interesting in even colourful markings options. 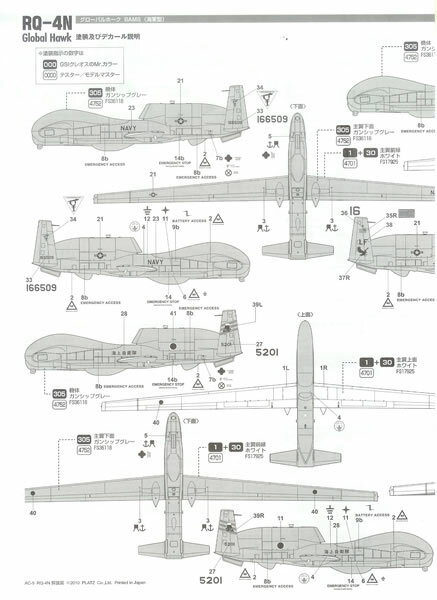 However after looking into the background of the RQ-4N I realised that these schemes are all of the “What If” variety. This is because the RQ-4N (now MQ-4C) is not in service yet. 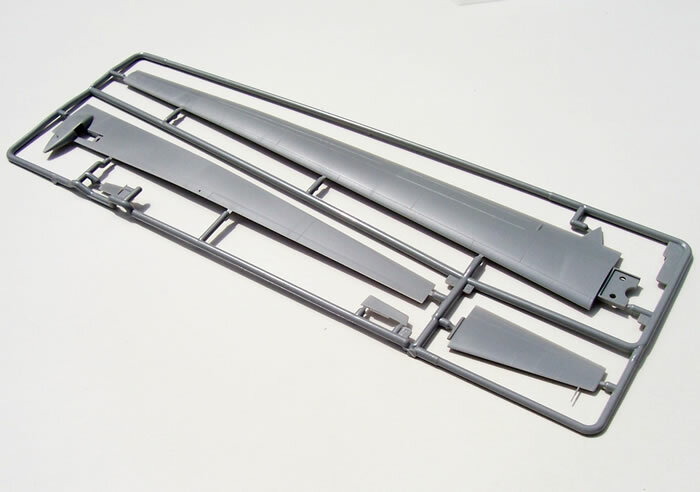 The decals however look to be very good quality, include stencils for the airframe, and are printed by Cartograf. Nowhere on the box is the buyer advised that all markings are for speculative or imaginary colour schemes. 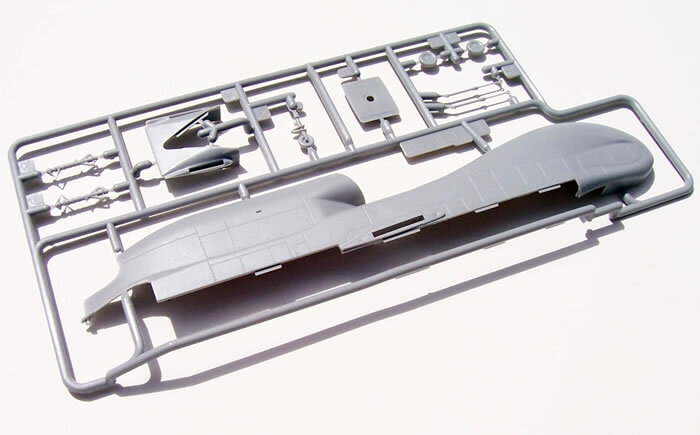 Personally I think such an omission is misleading, as there will be many modellers who assume that the kit has authentic colour schemes. I feel that the box art should make clear that the kit has “What If” markings. I can understand the commercial opportunity Platz has to offer as many Global Hawk versions as it can, even if they are speculative. Plus they will have another chance at additional releases as various versions like the MQ-4C come in years to come. But an RQ-4n (MQ-4c) release in 2011 may be viewed as premature by some, not just in terms of markings, but also the final configuration as conceivably things like sensor fairings could change before production. This speculation aside, it’s a pity that markings for the two trial Global Hawks are not included so that an authentic USN model could then be completed. 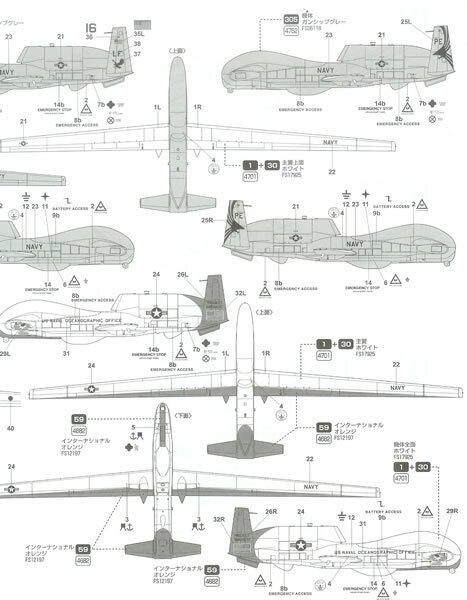 I would have been happier for the kit to include the RQ-4B underside as well plus some authentic markings so there remained the option of building an in-service Global Hawk. 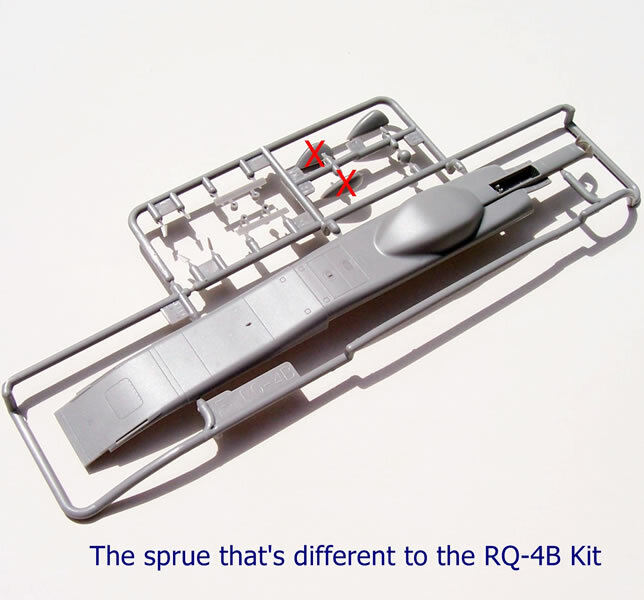 This is a very nice kit and that can be expected to build in the same way as the RQ-4B reviewed by Brett Green. This release is to some degree an understandable pitch by Platz for additional sales by exploiting their RQ-4B Global Hawk tooling. However it is also possibly premature because the MQ-4C (RQ-4N) does not rollout until next year, and is not expected to be in service until 2015. The absence of authentic markings for the trial RQ-4N’s is a pity. “What If” markings would be ok if the buyer is clearly warned about them on the box prior to purchase, but in this case they are not. I feel this is a misleading practice, and kit manufacturers should be discouraged from doing it. 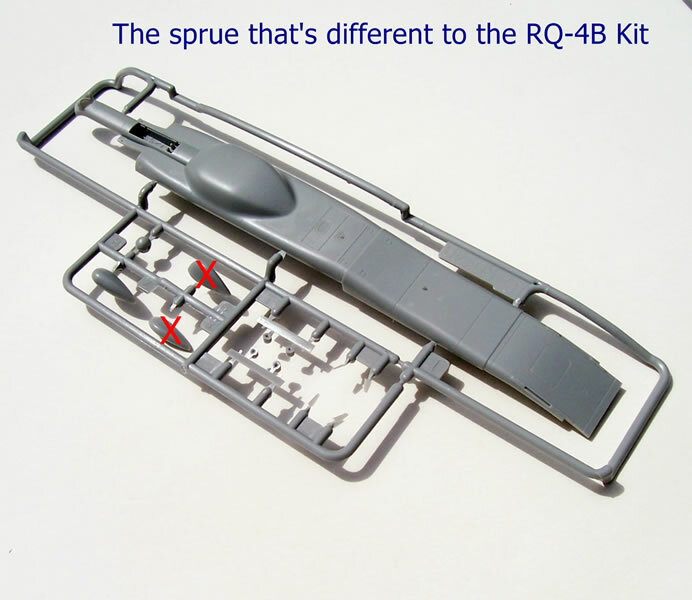 With the above in mind I recommend holding off buying this RQ-4N kit until the MQ-4C is in production and Platz issue an accurate kit with in-service markings. 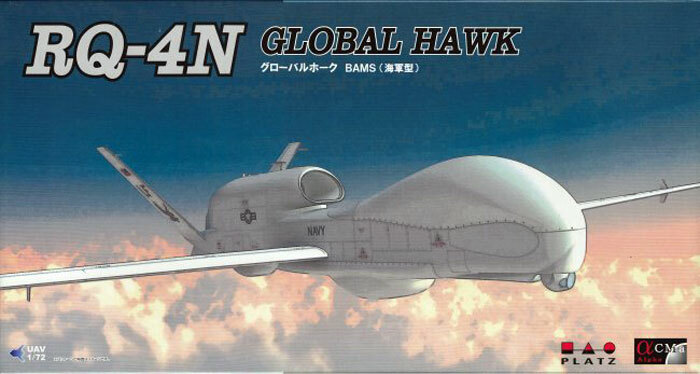 Meanwhile I recommend buying the Platz RQ-4B with authentic markings if you want a Global Hawk model.